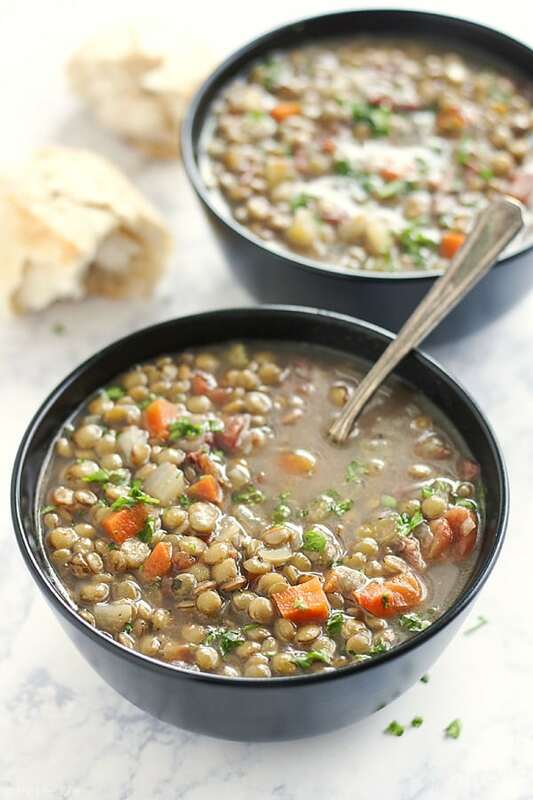 This (Sort of) Detox Lentil Soup is a very easy recipe. 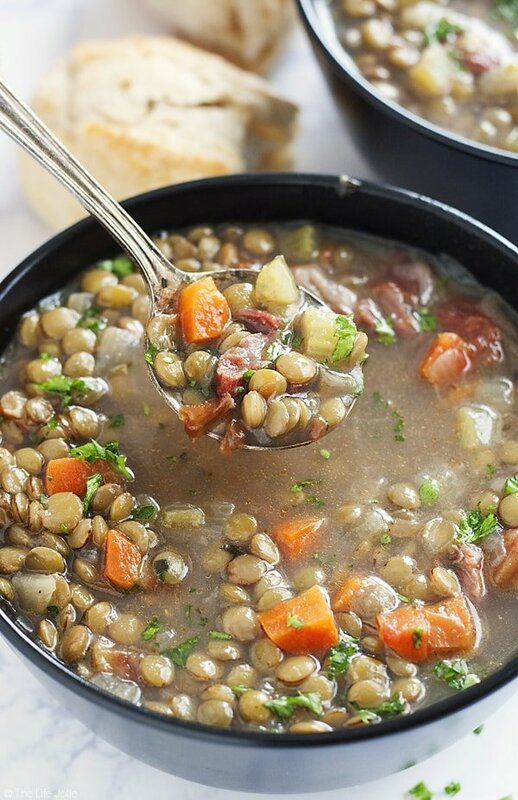 It’s healthy while still maintaining great taste and full of delicious lentils, protein and savory ham hocks for a smoky flavor! I feel like it’s been way too long since I posted a soup recipe. If you’ve been around for a while, you know about my mad love affair with soups. To me, there’s nothing more comforting than a hot cup of soup. When I managed a lounge at one of the hotels on the Las Vegas strip, I usually went in for my swing shift early to go to various meetings. One of my favorite parts of my work evenings was the time after these meetings when I would head over to the employee dining room and grab a cup of soup before having to head up to the casino. This resort always had a ton of food available to all employees on each shift, but my favorite was the wide variety of different types of soups that changed day-to-day. Each day there were a couple to choose from, some your traditional soup fare and others more unique and interesting flavor profiles. While I’ve always enjoyed soup in general, my love affair with it really began to peak in my time at that casino. And here we are today, me and soup, still going strong. You guys, I think it’s serious! Anyway, now that the holidays madness is over, I’m looking for two things in my meals. Food that helps me feel like I’m detoxing from my holiday binging and food that’s comforting in our freezing cold Western, NY climate. Often these two things are not synonymous. But that’s another thing I love about soup- it can very easily bring the comfort and detox in one deliciously cozy bowl. My mother-in-law gave me this recipe. I had mentioned one day in conversation that I grew up eating lentils prepared one way: in marinara sauce and served mixed with either rice or cut up linguine (ie- Italian comfort food heaven). Well Vicky couldn’t believe that I’d never had lentil soup and immediately gave me her recipe. So I got to work. The first thing that struck me was how a mere 10-15 minutes into cooking, my house began to smell amazing. I’m talking smoky, savory and all-around delicious. A little while later, I was rewarded with a steaming hot bowl of lentil soup. It was bursting with delicious flavor and has been a mainstay in my soup rotation ever since! This makes a nice big pot that will feed you for a good weeks worth of lunches plus some. I love that this makes a large enough pot to share with the people you love, because there is no better way to share your love than by sharing your food! Now you’ll note that I referred to this as a “sort of” detox soup (I’m sure there are a few of you who popped over after reading the name of the recipe to find out what the hell I’m talking about). This is because I think one person’s detox is another person’s idea of regular food. While I strive to do things in moderation and live a somewhat healthy lifestyle, this is not a health food blog. I don’t support any specific “diets” even though I sometimes share recipes that fall within those certain diets. So while I find this soup satisfying and flavorful, this to me, is a nice option to have a detox of sorts after a few months of eating all the things. Are there detox-ier soups out there that are filled with a million different super foods? Sure. Will this fall under every single person’s definition of detox? Nope. Do I still use this soup as a nice way for me to detox after overdoing it? Yup. Bottom line- it may not be the absolute, most healthy soup there is. It’s simple and light after a gluttonous holiday season. In addition to a robust flavor, there are so many healthy things about this soup that I happily classify this as a delicious detox option to warm your bones on this chilly day! 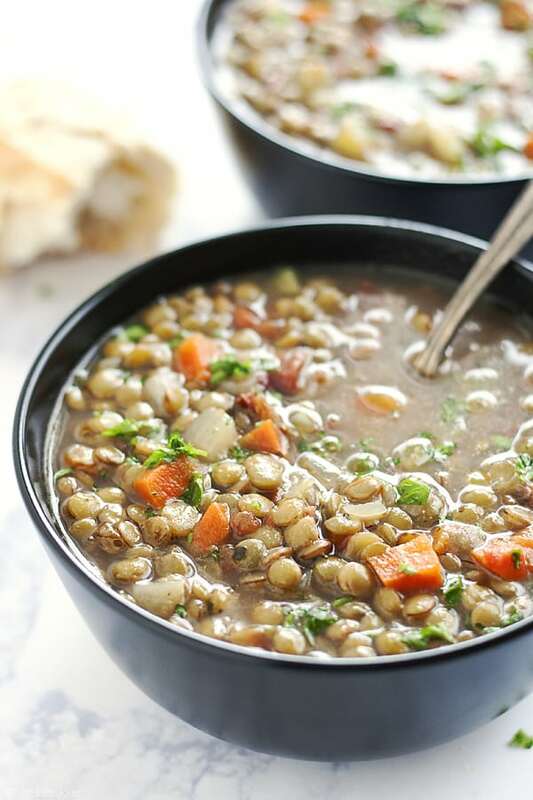 This (Sort of) Detox Lentil Soup is a very easy recipe. 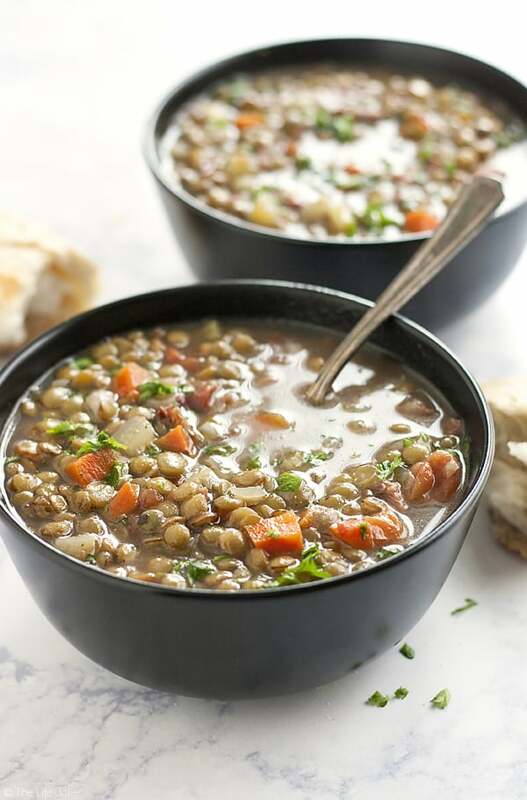 It's healthy while still maintaining great taste and full of delicious lentils, protein and savory ham hocks for a smoky flavor! Yields A big old pot!! In large pot, add your oil and heat it over medium heat. Add onions, celery and carrots and season to taste with salt and pepper. Sauté for about 3-4 minutes. Add garlic, bay leaves and thyme. Sauté for about 1 minute. Add chicken broth and can of tomatoes with juices. Then add your ham hocks. Bring liquid to a boil, then reduce it to medium-low and cook 1 hour until hocks are tender. Add lentils and cook for 30 minutes or until lentils are tender (it may take a bit longer, taste as you go). Remove the ham hocks to remove ham meat and add that back into the pot- dispose of the fat, skin and bones. If it seems to be drying out, add more water. Taste it and if need be, season with salt & pepper to taste. Serve with a garnish of chopped parsley (optional) and crusty bread. The ham hocks add a good smoky flavor but you can also just use a slice of cooked ham which you would chop up into pieces. We have also added small sliced pieces of kielbasa along with ham pieces. Sometimes there isn't a lot of ham on the hocks, so that's a good time to add sausage. Obviously when you use cooked ham with/without sausage, you don't need to cook a full hour like when using ham hocks. Sometimes the lentils can take longer to get tender, so taste it as you go. I've also noticed that ham hocks can vary by brand. So brands I've used have been especially strong in flavor and didn't need any additional seasoning. Others weren't as strong required a bit more salt and pepper added at the end. Again, taste as you go- as a general rule, salt and pepper add flavor and water tones it down. Don’t forget to follow The Life Jolie on Pinterest for more recipe inspiration. January 4, 2017 at 2:16 pm I'm making lentil soup today and now I wish I had ham hocks to add but I will be making this next time. Looks delicious. January 6, 2017 at 11:21 pm Thank you, Amanda! It is pretty tough to decide, and that's another thing I love about soup in general- so many great options! January 4, 2017 at 4:10 pm I bet the ham hocks give this a beautiful smoky flavour! I also love soup and it's great at this time of year for adding lots of of extra vegetables into your diet. January 6, 2017 at 11:20 pm I am all for adding a little smokiness- I've had it with the other meats listed in the notes and while it's still delicious that way, the ham hocks have my heart! January 6, 2017 at 11:19 pm I am too, Elaine. She is so generous with her recipes (and always makes us delicious meals when were with her!). I'm very, very lucky to have joined my husband's family! I also love soup any time of the year. It's interesting to hear about your grandmother eating hot soup to cool off- I had an acquaintance a while back who was British and he told me that it was customary to drink hot tea in the summer to cool off. It sounds like he and you grandmother may have be onto something!